On the 50th anniversary of the original release of Sgt. Pepper’s Lonely Hearts Club Band, Apple released a brand new mix. This is not some simple remaster, they actually went back to the original tapes from before they were dubbed down to make room for more voices or instruments, and before mixing. This process provides the best sound possible. The remixing was done over a couple of years by Giles Martin, son of the extraordinary Beatles producer George Martin. His goal was to make a stereo version that approximated the mono mix that George Martin and the Beatles worked on for weeks, and had considered the main presentation of the album. There’s no doubt Giles achieved the goal. This is the best Sgt. Pepper has sounded. It has a fullness to it, and the voices and instruments are properly centered and mixed. But…does that mean you should buy it? The bottom line is…the remastered CD that was done in 2009 is great, and the recordings sound exactly as you remember them. The new mix is even better, but unless you listen to them closely through a good sound system, you might not be able to hear much difference in quality. If you never bought the 2009 version, or simply want the best sounding version, get the remix. Warning: There’s a problem with buying the album from an online music service like iTunes, instead of an actual CD. When songs segue into each other such as “Sgt. Pepper” into “With A little Help From My Friends”, and “Sgt. Pepper (Reprise)” into “A Day In The Life”, there can be an audible flaw in the smoothness of the transition. That’s because the cuts are sold separately online, and they don’t necessarily come together well. Update: Sgt. 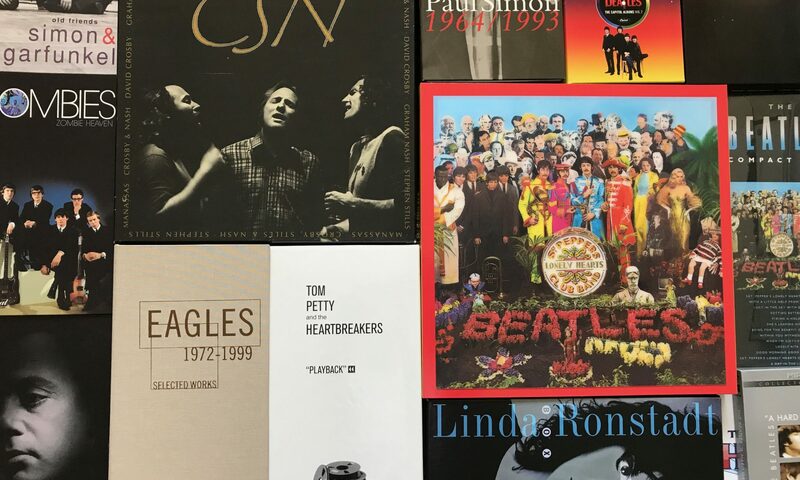 Pepper engineer Geoff Emerick, in a discussion with writer Bob Lefsetz, says that claiming the original stereo mix was rushed is “rubbish”. Emerick says the stereo mix was discussed with The Beatles, and then a lot of time was spent “getting it just right”. That’s the version you hear on the 2009 remaster, because remastering doesn’t alter the mix of the voices and instruments. The new Super Deluxe remixed version is for hard-core fans. I’ve never bought a high-priced super deluxe version of anything before, but it came out near my birthday…that’s my excuse. The box is basically the size of an album, but is deep enough to hold a 144 page hard cover book of articles and photos, plus 4 CD’s and 2 DVD’s. The cover on the box is a 3D photo sleeve that covers a replica of the studio tape box. The best deal we found was $118 through Amazon. The extra CD’s are filled with earlier takes of songs. This gives some insight into how the final versions developed. But, how interested are you, and will you listen to them more than once? You may remember that “Strawberry Fields Forever” (recorded during the Sgt. Pepper sessions) is made up of two different takes. One take is slower, and the faster take has added horns, strings, and more. You get them both. I also really like the complete instrumental bed for “She’s Leaving Home”…strings and a harp, simply beautiful. One DVD is Blue Ray, and the other is standard. They contain the same videos, the 1992 documentary “The Making of Sgt. Pepper” and the classic videos of “Penny Lane”, “Strawberry Fields Forever”, and “A Day In he Life”. Plus, the audio for Sgt. Pepper is 5.1 surround sound. “The Making of Sgt. Pepper” video is marvelous. George Martin (with a little help from his friends) tells us how the album was made. He sits at the mixing board and adjusts the volumes on voices and instruments to demonstrate various aspects of the recordings. What a great format! This is the basis of so many similar documentaries, such as the “Classic Albums” series. 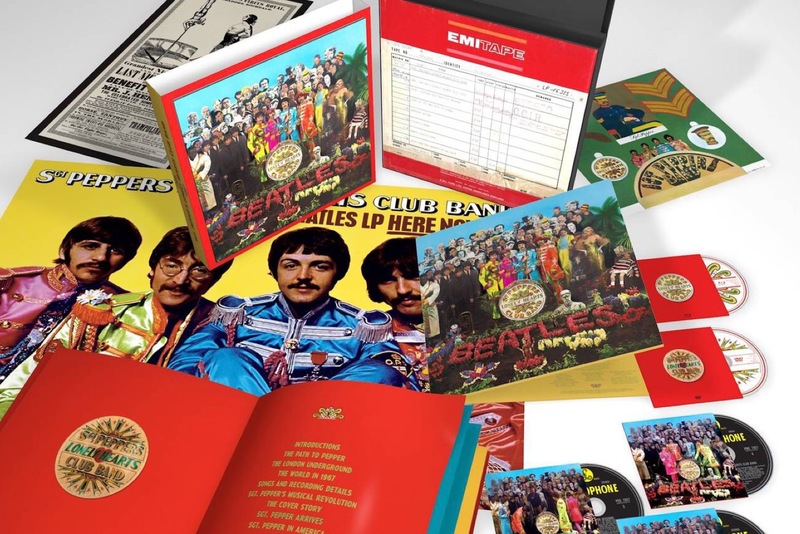 Everything about the Super Deluxe version is first class, but it’s definitely overpriced…unless you’re a spoiled Beatles fan with a wife willing to make it your birthday gift.